The Kokomo Wildkats celebrate its 44-41 upset win over No. 4 Homestead Friday night. Think again. After 48 minutes of grueling football, it is highly doubtful that Homestead (10-1) would call the Kats mild, especially after the final Kokomo (9-2) drive that ended in a Blake Brutus 19-yard field goal for the win. Following a game-tying, 27-yard touchdown run by the Spartans all-state candidate quarterback Zach Terrell, Kokomo started its game-winning drive from its own 24-yard line with 4:28 on the clock – and they promptly were called for a hold, moving the ball back to the 14 yard line and forcing a Kokomo timeout. Following the timeout, Gordon Jenkins got the ball moving with a 14-yard rush over the left end. The Kats then had positive runs of five, four, nine, six, five and eight to set up a first and 10 at Homestead’s 35. Kokomo then went to the well and pulled up a halfback pass to perfection as Armon Bridgeforth found Jenkins for 13 yards with one minute left. Two plays later, Bo Butler had back-to-back runs and the Kats were sitting on the two yard line. Kokomo let the clock tick down to five seconds before calling a timeout, and Brutus and split the uprights with his second field goal of the season. Homestead tried to return to the kickoff, but Kokomo stopped the runner and started celebrating its first trip to a sectional championship game since 1996.
wanted to get off to a quick start, but Terrell had other plans as he fired a pair of touchdown passes in the first seven minutes to put the Kats down 14-0. But Kokomo was not about to let Homestead end it successful season as Bridgeforth caught a Tayler Persons pass and ran it 42-yards for the Wildkats first score. A third Terrell touchdown pass put the Kats down 21-7 after one quarter. Kokomo finally made its first defensive stop three minutes into the second quarter, forcing a Homestead punt. That is when the “Wild” was reinserted back in front of Kats and Kokomo found its mojo. Homestead punted to Bridgeforth, who zigzagged through the special team defense for a 64-yard punt return for a touchdown, setting a new KHS record for most in a career with three. He also broke the KHS season (314) and career (505) records for most punt return yards. Kokomo then capitalized on a Terrell fumble, scoring on a two-yard Butler run to tie the game at 21. Homestead scored one final first half touchdown to take a 28-21 lead into the half, but the momentum was squarely with Kokomo. Bridgeforth found the end zone for the third time to start the scoring in the second half. On Kokomo’s first possession, he capped a 62-yard drive with an 11-yard rush over the right end for a touchdown, but the point after was blocked, and the Spartans held a 28-27 lead. After another defensive stop, Kokomo regained the lead on a Butler 25-yard touchdown run to give Kokomo a 33-28 lead. Both teams traded yardage and scores the rest of the way, with Kokomo holding the ball last and hitting the game-winning kick. The Kats were led by Bridgeforth who had 159 yards rushing, 13 yards passing, 43 yards receiving and 64 punt return yards – and the three touchdowns. Butler finished with 151 rushing yards and two touchdowns – plus he ran in a key two-point conversion. Quarterback Tayler Persons had his best game of the year with 86 yards passing and 83 yards rushing, including a touchdown on the ground and one through the air. 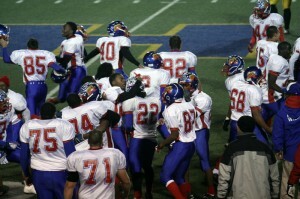 In all, Kokomo accounted for 565 offensive yards – the third best total in Wildkat football history. And an even more important stat is Kokomo held the ball for nearly 29 minutes, compared to just over 19 minutes for Homestead. The Spartans counted with 492 offensive yards. They were led by Terrell, who had 373 yards through the air and 63 on the ground – good for five touchdowns. He is the first Kokomo opponent to pass for more than 300 yards since the 317 yards for Anderson’s Matt Pettigrew in 2004. In addition to the trio of punt return records, Bridgeforth also broke his own school record for all-purpose yards in a season with 2,177. He had 2,018 last year. He is 56-yards away from breaking Braxton Shelton’s career record of 4,607 all-purpose yards. Kokomo will play nemesis Fort Wayne Snider for the sectional championship Friday night at Walter Cross Field. Snider beat Fort Wayne Northside 35-14 to advance to the finals, and they have knocked the Kats out of the tournament the last two seasons. The Western Panthers (9-2) wasted little time in dispatching Mississinewa (8-3), securing a 29-7 halftime lead and then setting the cruise control. Western now advances to the Class 3A Sectional 19 championship game Friday night. They will host Bellmont (4-6), who beat Yorktown 22-7. Like Western, Northwestern (10-1) jumped to an early lead and never looked back. The Tigers led 35-0 against an overmatched, one-win Delphi team. The Purple Tigers now advance to the Class 2A Sectional 28 championship game against Tipton (7-4), a 35-7 winner over Benton Central. This entry was posted in Football, High School, IHSAA, Kokomo, Sectionals, Tournament, Uncategorized, Wildkats. Bookmark the permalink.